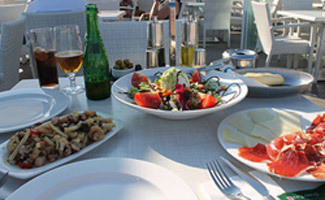 Delicious tapas, cold sangria and cervezas, laid back lifestyle, all in the magical and beautiful backdrop of the coast? What’s not to love about Mallorca. Mallorca, a Balearic island off the coast of Spain, it is a hidden gem if you ask me. Just a short flight from London (or direct flights to dozens of other European destinations) it is full of history, charm and a perfect mix of both sightseeing and relaxation. There are cathedrals, museums and of course shopping. And all extremely affordable. My first time to Mallorca, and hopefully not my last. I wanted to recap some of the places we stumbled upon as tourists in hopes that it would be useful for others should they get so lucky to experience this place (aka heaven on earth). Although it’s a relatively small island, when exploring Mallorca there are a number of areas you can stay in. The most popular area being Old Town in Palma. Situated in the city center it provides both easy access to cultural attractions as well as the water front on the port. We stayed at UR Mission San Miguel, part of a small, boutique hotel group which has a few different options. It was a toss-up between San Miguel and a couple other of the UR hotels but so glad we chose this one as it was by far the most local ambience and charm right in the middle of all the action. Upon arriving to Palma, we took the city bus which drops off at Plaza Espana right in the middle of Old Town. From there the hotel was just about 100 steps away. The hotel had great/friendly staff, gorgeous rooms and a perfect location all for a great value. We stayed 3 nights and it was just right to experience Old Town and the cathedral and port area. Free wifi and fridge in the room along with flat screen TVs and an amazing rain water shower. All of this came at a very affordable price. The hotel is situated on a quiet street with large doors you could open up at night to let fresh air in while you sleep. Highly recommend to anyone touring the city who wants a perfect place to call home. There are cruise ships that come and go from the port so there are a string of touristy hotels along the coast, but if you want to stay at a more beachy resort, I recommend going just up the coast to the north side of Palma in an area called Illetes. And as a tip, the city bus reaches the hotel, so you can catch a ride from Plaza Espana in the city center which takes you to the hotel – it takes a while and makes lots of stops though so plan ahead if you are trying to catch a flight. We stayed at the Zhero hotel, another boutique tucked away just off the main road but still close to lots of local restaurants and small beaches. Although small, Zhero still has all the amenities of a full 5 store resort. No spa, but they can arrange for you if need be and there is a pool at the hotel, but their beach club is located just a 5 minute walk away, which is a great alternative to the hotel pool. There is also a small public beach down the street, complete with a dive restaurant. It was a great, relaxing place for anyone looking for a holiday and escape from the world but still close to lots of things to do in Old Town. Our first meal in Spain was after a long day of traveling and it was probably my favorite meal in the capitol city of Palma. We ate at Darsena – not only because we were so excited to be in Spain but also because it had a gorgeous view of the port on the water and we were in awe of how fresh and delicious everything was. We had tapas and we shared a salad with the biggest heap of fresh mozzarella, a fish medley with potato strings, “squid rings” aka calamari, a plate of Spanish queso and jamon and big glasses of Sangria and beer. We walked down the pier and enjoyed the sunset. Then we took a cab back to a little cafe by our hotel to split dessert but for the life of me I can’t seem to remember or find the name (maybe too much Sangria?!?). Tuesday we took a bus to the airport to get our rental car. Then we drove an hour through the mountains where we parked and took the old streetcar into the Port de Sollier. At this point, we were so in awe of the beauty of this magical place, and were so hungry we didn’t care where we ate so much. We just picked the first place that we found that had vegetarian options and a view of the beach. It was kind of a touristy spot but a hamburguesa and torta hit the spot. We came to find out later in the day that we missed out big time because the real place to be at with the real view was just up the hill. We couldn’t let this opportunity pass us by so we enjoyed a drink there and soaked in the view thinking how incredibly lucky we are. This was by far the most “pinch me” moment of the trip (and there were a bunch). Then, we grabbed some gelato before catching the next streetcar back into Sollier. Later, we drove along the Mallorca coast for some amazing views before returning the rental car and going back to the hotel to change for dinner. And we found yet another place to enjoy tapas! In our experience, you can’t go wrong with shared small plates or with food in general in Spain. And it’s all surprisingly affordable too (more so than London for sure). We were kicking ourselves for not seeing the cathedral the previous night so we headed back down near the water to check it out. Once there, we found a little pocket of restaurants that all looked good but we decided on Seis Niñas. This was such a random spot but the food was delicious! We had more “squid rings” as well as a plate of mussels. Then we enjoyed an after-dinner drink by the reflecting pool, the best view in town. Wednesday we checked out of our hotel but had a few hours to kill before checking into our next hotel. So decided to try out the place my dad loved when they visited a few months earlier (he loved it so much he and my mom actually ate their twice! and he never does that!) But, now that I have eaten there, I can understand why. Cellar Pages was located in a little cottage-like building that was tucked away from the street. In fact, there was hardly a sign so you wouldn’t even know it was there if you were not looking for it. Thank goodness we had good directions! We got there around 1:45 pm (early for Spanish lunch time) and were the only ones there. I was thinking maybe they’re only open for dinner but she said no come on in and proceeded to tell us about el menú del día – that apparently is what everyone gets. And by everyone I mean the entire restaurant that was filled with locals by 2 pm. For less than 20 Euros we got a salad, main dish, drink and dessert. It included things I couldn’t eat (chicken with cream sauce) and things I could (white bean salad, cold zucchini soup, stuffed peppers and we split the tiramisu). Now, I see why my parents (and everyone else) raved about this place – the chef even came out at one point to say hello to some of the regulars. After this big feast, we took a bus over to Ses Illetes Beach area and checked into our hotel. We were so full from lunch that we ate a late dinner at a small family-owned Italian restaurant called La Trattoria overlooking the water (by now we had figured out that the safe vegetarian go-to restaurant was Italian – not just pizza, but Italian.) Plus, they’re on every corner almost like the American equivalent of Starbucks. Although I follow a gluten-free diet at home, I couldn’t resist. I indulged in some amazing homemade pasta and Matt had beef Milanese while overlooking the sunset and the sea of the Mediterranean Sea. Lunch on Thursday was at Beach Bar. It was a total dive but was among my favorite dining experiences. And we finally got our Spanish paella which was made and served table side (and sea side). You can have your sangria, beach and paella and eat it too. After a full day of sand in our toes and our butts in the sand, we showered up and had our last and final Spanish meal – Japanese, of course! Our hotel had an Asian fusion restaurant and it was amazing. We had sushi, miso soup and tempura shrimp avocado rolls. Nothing like eating fresh fish with a view of the water. We enjoyed dessert on the deck after dark while we watched planes take off and faced the sad reality that when we woke up tomorrow it would be time for us to leave on a plane too. We checked out of our hotel but before leaving the island we wanted to squeeze in one last bite since we knew it would be a long day of travel and airplane/airport food. Matt kept saying, “this place is packed every time we walk by”, so we has to try it out. And it happened to be an English family that owned it – we are starting a trend of ending our trip with a meal that is from the location we are going to next. I couldn’t get enough fresh mozzarella, bread and olive oil/vinegar to mop up a plate of deliciousness with one final glass of cava before boarding the plane. Mallorca (and most of Spain) offers my perfect cuisine type: small plates (tapas) and snacks to enjoy with friends and a good glass of cold sangria or cerveza – and all for an affordable price! With simple flavors and fresh ingredients paired with the island’s beautiful scenery and a touch of hospitality, you really can’t go wrong in Mallorca, Spain, when it comes to food. Highly recommend to anyone…can’t wait to return! The tour to the restaurant seems to be interesting and a definitive one. In a restaurant one should eat, drink, and love all the things.